The Story Wall appMany young people have confidence issues when it comes to writing stories and this is what The Story Wall aims to tackle. Having the help of friends when writing a story will help build confidence and creativity about story ideas. When people are writing stories on The Story Wall they can ask people for help when they get stuck. They can then choose their favourite ideas and add them to the story. When the story is finished they can post it to The Story Wall where the people that participated in the story can read it, email it or post it to Facebook. With a word limit of 1500, the story will be just the right length for reading on a phone. On the app there is another feature which we think will be used in the classroom. Teachers’ stories is an option where a teacher can add their pupils to a story for homework or class work. The difference is that only the teacher can see the story ideas, the pupils will only be able to see their own idea; this prevents copying and allows the students to be original with their ideas. I think that the teacher’s stories could be used in classrooms to encourage children to use technology t o learn, and would also promote cross curriculum learning. I also believe that it would encourage children to write stories themselves and make the task of writing stories for tests or GCSEs less daunting. I enjoyed my experience with Apps for Good very much. They have widened my horizons and what I would like to do in life. I have learnt how to code HTML and have improved my confidence with presenting in front of an audience. I also enjoyed my experience with Quick Blox (the professional development company that helped build the app) and would recommend them to make anybody’s app. The entire experience has affected my life for the better and will be something that I will tell my children when I am older. I would recommend teachers to get their students to participate with Apps for Good as it can be life-changing and can open up children’s minds to the world of technology. It is just a really amazing organisation and I am proud to have an app with them. Our app is available on the Apple app store, which you can find by going to the Story Wall page. It is free, and we hope to see you writing stories soon. The team, school and developers decided to go with an iOS version of the app; there is currently no plan for an Android version. Emma is part of The Story Wall team. She is 14 years old and goes to Cockburn School in Leeds. She lives at home with her parents, brother, the cat and her guinea pigs. She enjoys music, dance and creating the app. She is currently taking music GCSE and enjoying it very much. 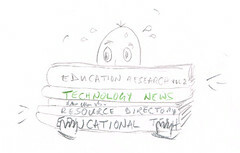 Emma’s article was first published in Digital Education, the free newsletter for those with a professional interest in educational ICT and Computing. I was very pleased that Emma was able to contribute, as that particular issue also featured an article entitled Where are the girls in ICT and Computing? To find out what other articles were in the same issue, please see the article entitled Digital Education. To find out more about Apps for Good, and how to get your school in on a great act, go to their website: Apps for Good. At the time of writing, applications are open t schools in the UK.